n a bright spring morning, 95-year-old Hilton Head artist Walter Greer is sitting on a couch in his den, the walls around him covered by his treasured works. Behind him hangs his portrait of his wife, Margaret. To his right is a scene he captured from memory after he had floated in a balloon above a mountain in Snowmass Village, Colorado, where he was the summer resident artist during the 1980s. And straight ahead on the far wall is The Acolyte. The oil on canvas painting was one he could never put on the market, and it has remained in his home for many years. But when St. Luke’s congregation, of which he and Margaret are longtime members, began to raise money and plan for a $3.4 million expansion, the Greers decided The Acolyte should have a new home. On April 24, the couple officially donated the painting, valued at $25,000, to the church. A limited number of 20 reproductions were made from the original and are now available to the public at $1,500 unframed or $2,000 framed, to assist with the fundraising drive. Once the church expansion is complete, the original will become the centerpiece of the church’s future interactive “Walk of Light” hallway, connecting the current sanctuary with the planned parish hall alongside a presentation of displays reflecting on the historic church’s past, which dates to the 1700s. Known by many as Hilton Head Island’s first resident artist, Greer has focused his paintbrush primarily on the Lowcountry’s natural beauty and its people since he arrived on the island in 1960. His Lowcountry scenes and portraits have adorned hundreds of walls in galleries and homes and have fetched thousands of dollars at auctions. But some of those paintings held special meaning for him, like The Acolyte, and they have remained a part of his private collection. He purposely painted the back of the acolyte rather than his face and used subdued background images to cause the viewer’s eyes to drift to the candlelight. “Everything takes you to the flame,” he said. Rev. 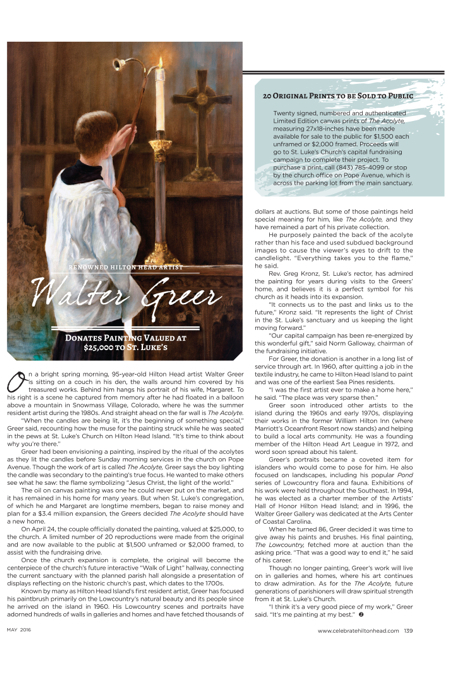 Greg Kronz, St. Luke’s rector, has admired the painting for years during visits to the Greers’ home, and believes it is a perfect symbol for his church as it heads into its expansion. “Our capital campaign has been re-energized by this wonderful gift,” said Norm Galloway, chairman of the fundraising initiative. For Greer, the donation is another in a long list of service through art. In 1960, after quitting a job in the textile industry, he came to Hilton Head Island to paint and was one of the earliest Sea Pines residents. Greer soon introduced other artists to the island during the 1960s and early 1970s, displaying their works in the former William Hilton Inn (where Marriott’s Oceanfront Resort now stands) and helping to build a local arts community. He was a founding member of the Hilton Head Art League in 1972, and word soon spread about his talent. Greer’s portraits became a coveted item for islanders who would come to pose for him. He also focused on landscapes, including his popular Pond series of Lowcountry flora and fauna. Exhibitions of his work were held throughout the Southeast. In 1994, he was elected as a charter member of the Artists’ Hall of Honor Hilton Head Island; and in 1996, the Walter Greer Gallery was dedicated at the Arts Center of Coastal Carolina. When he turned 86, Greer decided it was time to give away his paints and brushes. His final painting, The Lowcountry, fetched more at auction than the asking price. “That was a good way to end it,” he said of his career. Though no longer painting, Greer’s work will live on in galleries and homes, where his art continues to draw admiration. As for the The Acolyte, future generations of parishioners will draw spiritual strength from it at St. Luke’s Church. Twenty signed, numbered and authenticated Limited Edition canvas prints of The Acolyte, measuring 27×18-inches have been made available for sale to the public for $1,500 each unframed or $2,000 framed. Proceeds will go to St. Luke’s Church’s capital fundraising campaign to complete their project. To purchase a print, call (843) 785-4099 or stop by the church office on Pope Avenue, which is across the parking lot from the main sanctuary.